These structures are part of the Bio-ITEST curriculum. 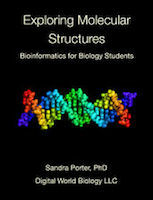 Structures used in the Bio-ITEST curriculum. To view the collection, you will need to download and install the iPad version of Molecule World. Once Molecule World is installed on your iPad, return to this page and download the entire collection at once by selecting the mwc file. The normal form of 5-Aminolaevulinic Acid Dehydratase. This protein is involved in synthesizing heme. A mutant form of 5-Aminolaevulinic Acid Dehydratase. The mutation causes F12 to replaced by a leucine (L). For the best comparison, look at the leucine at PDB position 12 in chain B. Human superoxide dismutase with copper and zinc. Human superoxide dismutase with a mutation that replaces His 46 with arginine.